EAC has recently been contacted by NSW Fair Trading after the Regulator was contacted by the NSW Civil and Administrative Tribunal “NCAT” regarding their concerns encompassing the service, via email, of Termination Notices. It would appear, the first round of electronically served termination notices are being tendered in termination proceedings before NCAT. It comes with little surprise that the issues surrounding dubious service of notices electronically are being raised by the Honourable Tribunal. As our Members are no doubt aware, changes were recently made to the Residential Tenancies Act 2010 regarding the service of notices and other documents under the Act. The changes to the service of notices came about pursuant to the Electronic Transactions Legislation Amendment (Government Transactions) Act 2017. Schedule 1 of the Act provided for changes to section 223 of the Residential Tenancies Act. EAC Members that attended the recent 2017 EAC Insight Roadshow will be aware of some of the concerns regarding the effective service of a notice via email by agents. Notwithstanding, the changes regarding electronic service are being heralded as long overdue and extremely relevant in 2017. The first thing to note is that you will need the tenant to agree to you serving them via email. We have created the Email Service of Notices and Documents Authorisation Form for this purpose. This could be emailed to a tenant for their approval and authorisation to receive notices under the Act. 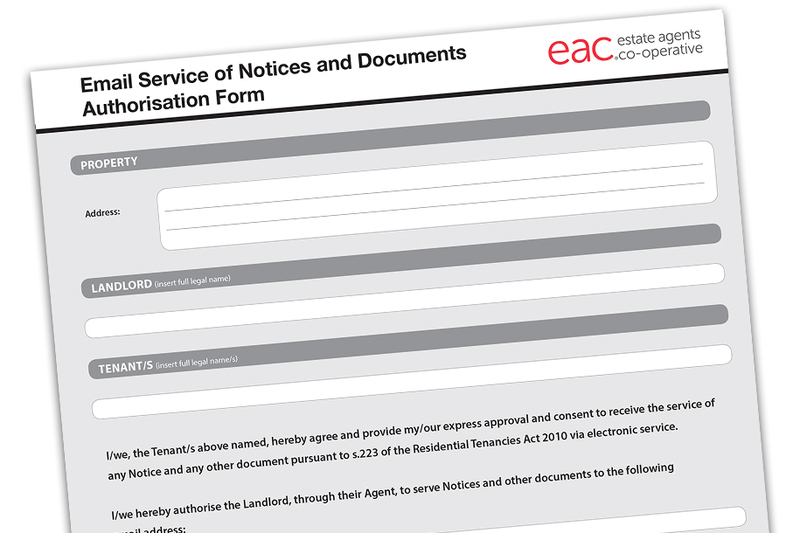 If a EAC Member has an email address loaded on the tenant screen in the rental software, which was originally provided on the Tenancy Application, can the Member use that email address? Best practice is to obtain a written authorisation from a tenant. The tenants should ‘opt-in’ to receiving notices electronically. Remember, email addresses can be changed for various reasons. A prudent EAC Member would obtain a current authorisation from a tenant prior to serving any notice electronically. Notwithstanding, this authorisation could be tendered in evidence in any proceedings before NCAT. Does electronic service differentiate between a termination notice and service of other documents? A landlord may, at any time, give a termination notice for a periodic agreement. The termination notice must specify a termination date that is not earlier than 90 days after the day on which the notice is given. The Tribunal must, on application by a landlord, make a termination order if it is satisfied that a termination notice was given in accordance with this section and the tenant has not vacated the premises as required by the notice. This section does not apply to a residential tenancy agreement if the tenant has been in continual possession of the same residential premises for a period of 20 years or more. A landlord may give a termination notice on the ground that the tenant has breached the residential tenancy agreement. The termination notice must specify a termination date that is not earlier than 14 days after the day on which the notice is given. The termination notice may specify a termination date that is before the end of the fixed term of the residential tenancy agreement if it is a fixed term agreement. the termination notice was given in accordance with this section and the tenant has not vacated the premises as required by the notice. the previous history of the tenancy. if the landlord and tenant fail to agree under section 53 to show the premises to prospective purchasers, not more than twice in any period of a week, if the tenant is given not less than 48 hours notice each time. the notice is given at least 60 days before the increased rent is payable. Do you include the ‘day’ you serve the notice electronically? The Tribunal will define a ‘day’ as a ‘clear day’ therefore, you do not include the day you serve the notice in your relevant calculation of a prescribed notice period under the Act. Do you have to email all the tenants or can you serve the notice electronically on one tenant? This is provided for in Section 223(3) which provides if there is more than one landlord or tenant under a residential tenancy agreement, a notice required to be served on a tenant or landlord under the agreement is taken to be served on all the tenants or landlords under the agreement if it is served on one of the tenants or landlords. As a reminder for Members, property managers have access to specialist tenancy solicitors at Jemmeson & Fisher Solicitors who will assist you with your inquiries. When the need arises just give us a call on 1300 137 161 and we will put you through. Can a rent increase be sent via email ? Hello Ernie, Yes the Notice of Rent Increase can be sent to the tenant’s specified email address for the service of documents. We have a form that you can use for this as part of our Online Forms. I served a Notice of Termination to the tenants but I sent it via email The Tribunal is requesting for an evidence to prove that the tenants consented in receiving notices via email. The tenants filled the Residential Application Form with their personal details including email addresses. The said form has a declaration for which the tenants signed authorizing the agent to use and disclose this personal information in order to “refer to Tribunal/Courts and Statutory Authorities. Is the signed Residential Application Form sufficient evidence that the tenants has agreed to receive notices via email? We recommend you get in touch with our partner Jemmeson & Fisher Solicitors and Accountants to receive legal advice. EAC Members receive legal advice from Jemmeson & Fisher as part of membership. To obtain legal advice call 1300 137 161.